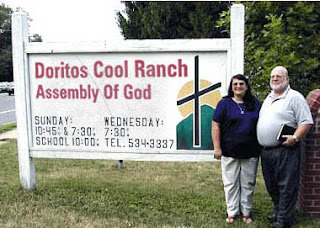 OR, another favorite- "Churches adopt Mascots"
If you don't appreciate satire and sarcasm, you will hate this site. *We* have been giggling at these stories all night and are highly entertained. We're thinking of becoming the 'Pillsbury Livesay Family' and 'Kodak Children's Int'l Lifeline' and seeing if we can't up our budget a bit.